Etched brass kit. LSWR Dwg 1227 SR Diag 139 Righthand corridor viewed from the brake van. 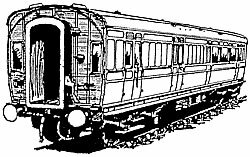 28 were built to this diagram between 1904 and 1911 for mainline expresses. Also built with lefthand corridor (Kit 4C96) After the grouping theyappeared on the Central and South Eastern Divisions as well, but ended their days in the South Western in the 1950s.